Tony Jackson capped a fine year as the master of Piel Castle Lodge No 6099 in delivering an excellent ceremony as he installed Lee Storey as his successor. The meeting at Barrow-in-Furness Masonic Hall was well attended with over 100 brethren being present to witness proceedings. Pictured from left to right, are: John Quiggin, Tony Jackson, Lee Storey and Peter Schofield. The principal guest at this special occasion was John Quiggin who was accompanied by five other grand officers including group chairman Peter Schofield. In addition to those distinguished gentlemen there were four acting Provincial grand officers present in the persons of Barry Fitzgerald, Reg Wilkinson, Barrie Bray and Steve McKellar. Quietly spoken Tony discharged the duty of installing Lee in a sincere and very pleasing manner. The address to Lee was orated by his father Peter Storey. Needless to say Peter’s work was conducted with great feeling and obvious pride. Lee’s brother Tom had been initiated into Piel Castle Lodge but had moved away. He had continued his Masonry however and has served as the master of a lodge in Banff under the Scottish Constitution. He too was on hand to observe Lee’s ascent to the chair. Acting officers Reg and Steve were called upon to deliver, respectively, the addresses to the deacons and stewards. The address to the wardens was delivered superbly by lodge secretary Dennis Laird with John reaching a similar standard of excellence in addressing the brethren. Pictured left from left to right, are: Tom, Lee and Peter Storey. Pictured right from left to right, are: Chris Gray, assistant secretary John Denby, Dennis Laird and treasurer Nick Collinge. 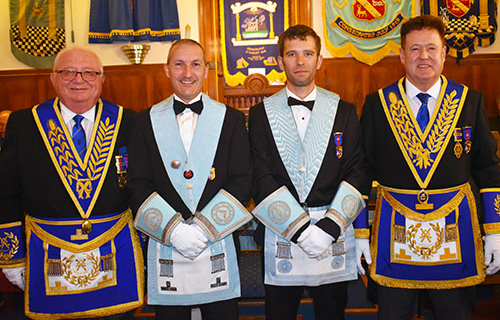 The working tools of an installed master were presented by Ian Cottam with Bill Joughin, Bob Heron and Tony undertaking that work in respect of the tools of the three degrees. All proved very accomplished in their work. The ceremony, under the guiding hand of lodge director of ceremonies Chris Gray, was conducted with due propriety and decorum but still managed to be undertaken with feeling and the occasional smile or two. It was a delight to witness. Pictured from left to right, are: Ian Cottam, Bill Joughin, Bob Heron and Tony Jackson. To mark the occasion, John was presented with three cheques by Lee. The first was for the sum of £800 in favour of the Masonic Charitable Foundation 2021 Festival. There was also a donation of £100 to the Masonic Trust for Girls and Boys and a further donation of £100 to the Rosemere Cancer Charity. In addition the lodge had made, during the course of the year, a donation of £247 to the Air Ambulance and another of £245 to St Mary’s Hospice. The Masonic hall building fund has also benefited to the tune of £272. 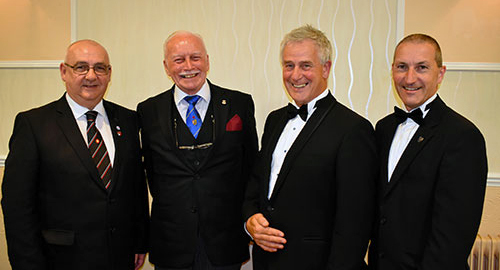 Following the formalities, 104 members and their guests enjoyed the installation banquet in the Fairfield Suite. The main course of beef was greatly enjoyed but the star of the menu was the caterer’s special sticky toffee pudding. A raffle at the banquet raised a further £578 for the hall building fund. Piel Castle Lodge was formed in 1945 and was so named because one of the founders lived on Roa Island and had a view over to the adjacent Piel Island on which stands the ruins of a 14th century castle. Piel Island and castle from Cavendish Dock at low tide.